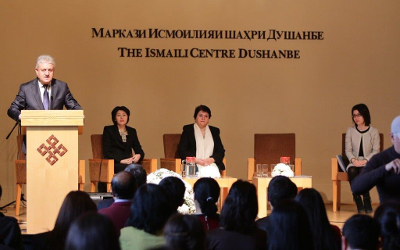 AKIPRESS.COM - The University of Central Asia (UCA) celebrated over 150 graduates at a ceremony at the Ismaili Centre, Dushanbe on December 5. The ceremony was attended by government representatives, Second Secretary Chief Tamura of the Japanese Embassy and other guests of honour, UCA said. Graduates from the University’s School of Professional and Continuing Education (UCA SPCE) and the Aga Khan Humanities Programme (UCA AKHP) received certificates in professional development and skills building programmes. UCA SPCE’s Practical Business Management Certificate Programme, offered jointly with the Kyrgyz-Japan Centre for Human Development (KRJC), students received their certificates from KRJC Co-Director Muneo Takasaka. They were congratulated by Tamura, who described the successful partnership between UCA and KRJC in delivering the programme for the second time in Tajikistan. Six graduates received the Accounting Technology Certificate, which is based on International Financial Reporting Standards and only offered in Central Asia by UCA SPCE. Over 70 graduates completed English programmes. The achievements of UCA SPCE instructors were also recognised. Four instructors recently received a Master’s in Management from Kyrgyz-Russian Slavonic University (KRSU), based on a partnership between KRSU and UCA under the Small and Medium Enterprise Growth Project for Central Asia, an initiative of the U.S. Agency for International Development and the Aga Khan Foundation. An additional 14 instructors successfully completed an International English Language Testing System (IELTS) professional development course. UCA SPCE Director Ms Gulnara Dzunushalieva congratulated graduates and emphasised the University’s commitment to providing internationally-recognised qualifications that meet the socio-economic needs of Tajikistan. “UCA’s strong presence in Tajikistan is evident in our three facilities in Tajikistan learning centre and new satellite learning centre in Dushanbe, and our town campus in Khorog. UCA’s main undergraduate campus is under construction in Khorog and scheduled to open in 2017,” added Dzunushalieva. Information on UCA’s upcoming undergraduate degree programmes in Economics, Communications and Media, Business and Management, Earth and Environmental Sciences, Computer Science and Engineering Sciences was also presented. Twenty graduates of UCA AKHP’s Humanities in English programme received certificates. Based on AKHP’s innovative humanities curriculum and pedagogy, the programme offers English-language instruction in critical analysis, ethical reflection, academic writing and reading. “Humanities in English offers a unique space for students to develop and articulate their own ideas and develop critical theoretical and practical abilities; valuable skills in today’s highly competitive labour market,” said Dr Pulat Shozimov, Acting Head AKHP.